For quantitative determination of α-amylase activity. AMYLASE belongs to the family of glycoside hydrolase enzymes that break down starch into glucose molecules by acting on α-1,4-glycosidic bonds. The α-amylases (EC 3.2.1.1) cleave at random locations on the starch chain, ultimately yielding maltotriose and maltose, glucose and "limit dextrin" from amylose and amylopectin. In mammals, α-amylase is a major digestive enzyme. Increased enzyme levels in humans are associated with salivary trauma, mumps due to inflammation of the salivary glands, pancreatitis and renal failure. Simple, direct and automation-ready procedures for measuring amylase activity are very desirable. 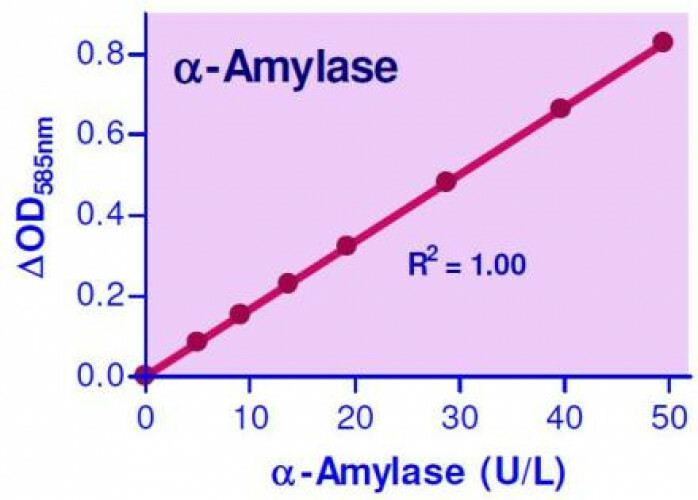 BioAssay Systems’ EnzyChrom™ a-amylase assay method involves two steps: (1). α-amylase in the sample hydrolyzes starch and the product is rapidly converted to glucose by α-glucosidase and hydrogen peroxide by glucose oxidase; (2). hydrogen peroxide concentration is determined with a colorimetric reagent. 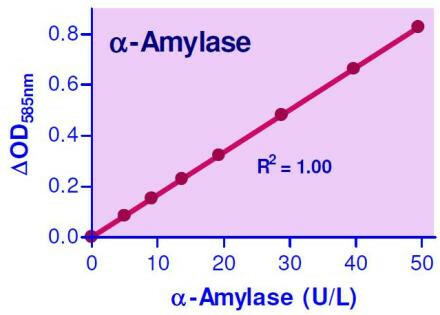 Applications For quantitative determination of α-amylase activity. References Assay: a-Amylase in Human Saliva.